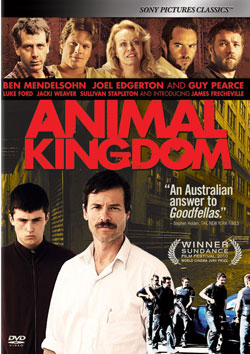 The Australian crime drama Animal Kingdom is a self-assured and effective feature debut from filmmaker David Michôd. Since picking up the “World Cinema – Dramatic” prize at Sundance last January, the movie has been getting praise and honors from all sectors — and it deserves it. You’ll never confuse the guys in the Cody clan of Melbourne for the Cleaver brothers. Let’s see, there’s the wired-up drug dealer Craig (Sullivan Stapleton, The Condemned); his troubled siblings, the raging-on-the-inside ‘Pope’ (Ben Mendelsohn, Beautiful Kate) and the repressed Darren (Luke Ford, The Mummy: Tomb of the Dragon Emperor); and Pope’s bank-heisting buddy Baz (Joel Edgerton, The Square). All abide by the final word given by the family matriarch Janine (Jacki Weaver), whose adorable nickname of ‘Smurf” belies the venom that underscores her every kind word (and the lingering kisses she plants on her sons’ lips). At the beginning, Animal Kingdom feels like a “small” movie, but by the half-way point, one realizes that writer/director Michôd has laid out a deceptively large and detailed but still intimate canvas populated by some half-dozen well-drawn characters, a slew of intricate, episodic scenarios and a thematic arc that questions if and when blood should be considered to be thicker than water. The camera-work, pace and editing is all quite controlled — Michôd doesn’t want to get ahead of himself as he presents the tearing apart of the Cody family — making the peaks and valleys of the story play out with an almost operatic feel. The performances are excellent across the board, led by Mendelsohn’s creepy and deeply disturbed ‘Pope’ and veteran Aussie actress Weaver, whose ‘Smurf” makes Lady Macbeth look like a candy striper. As far as special features, there are three solid bonuses, including a commentary by Michôd, a Q&A with Michôd and his cast following a screening of the movie at the Los Angeles Film Festival and a very comprehensive 70-minute-plus making-of featurette.